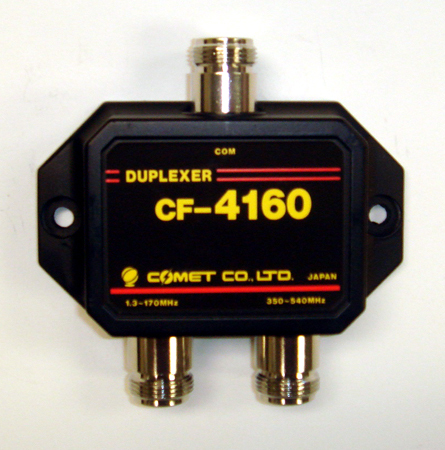 Comet calls these “duplexers”, but they are also referred to as combiners or splitters. They are basically band-pass filters, simultaneously passing RF in both directions through the common connector while the band-pass filters provide a high degree of isolation between ports. 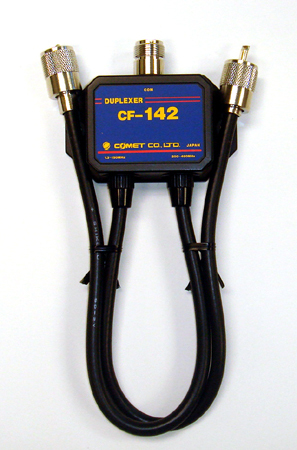 Allow a single coax run into two antennas at the top of the tower, and two radios at the bottom by using a duplexer at both ends of the coax run, avoiding cost and weight. 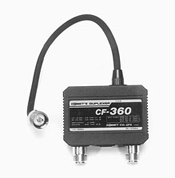 Choose from versions with a variety of band-pass frequency ranges, coax leads or no leads, and connector combinations. 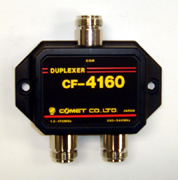 We are frequently asked if we have a Duplexer or Triplexer that will allow a dualband radio (with a single connector), and a single band 220MHz radio, to be used with the Comet CX-333 triband base antenna and/or Comet SBB-224 triband mobile antenna. The answer is: You need to use both a duplexer AND a triplexer to accomplish that. 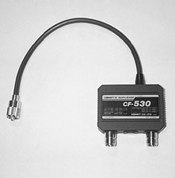 First: Use the CF-4160J, with the common port screwed into the dualband radio, you’ll need your own jumper terminating in a PL-259 on both ends. With the CF-4160J in place you have effectively turned the single connector on the radio back into two separate antenna connector….one for 2M and one for 440. This enables TX and RX on all three bands simultaneously! All UHF-female connectors. 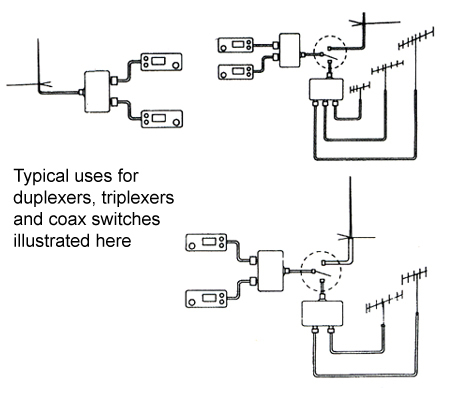 Choose your own length jumper between your radio and the duplexer. All N-female connectors allows low-loss N-type connectors with a jumper length of your own choosing. 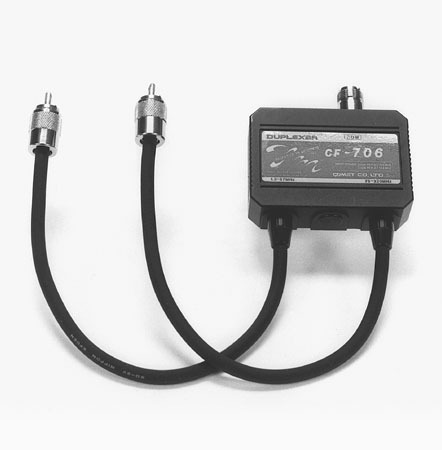 For the IC-706/MKII/G FT-100, etc.. 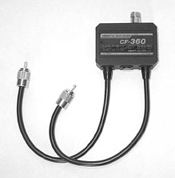 This version has a coax lead and PL-259 connector on the COMMON port. One connector for an HF-6M antenna, the other connector for a 2M-440MHz antenna. If desired, the 2M-440MHz connector on the CF-530C can then be split again if you want to use separate 2M and 440MHz antennas. 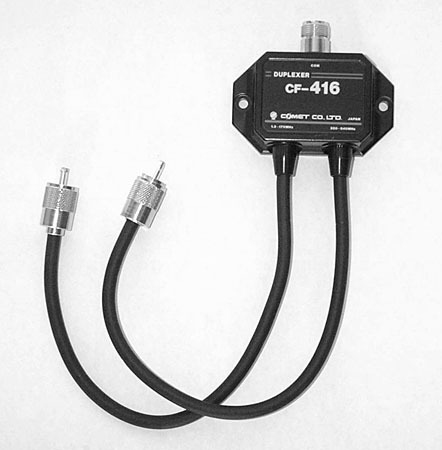 HF-6M/2M-440MHz duplexer for the IC-706/MKII/G, FT-100, etc..
To match the RX freq range of the IC-706MKII/G the CF-706A was engineered to pass the commercial FM band of 88-108MHz.